The report that im doing is going to be about how a business use communication within there company and how they process it. I will Research how new technology has changed a company with there communication externally and internally. Introduction The report that im doing is going to be about how a business use communication within there company and how they process it. I will Research how new technology has changed a company with there communication externally and internally. In a company they use ICT to order online and have full embraced ICT in the workplace to make the business run Smoothly, EDI, Spreadsheet to keep the information that is vital to the company. Also I will show how intranet and internet is useful within the Company. I will explain how information circulates from the different Areas within the business and how ICT has made it easy and possible to store large amounts of information about their customers. Most Companies store private and important information about their customers. This information has to be stored because it is needed to bill their customers and also to advertise Products so that they can interest and invite customers to Buy Things in there shops. ...read more. Mobile Phones- They would use there mobile phones in the airport for example, There's a Disabled customer is in a wheelchair and she needs to be on the aircraft then they would use a Phone to tell the Captain what is happening Email- EasyJet would use email to send messages to staff that work in the airport or even staff that work in the HQ. Internet- Forums and webpage's can be used to see if the reviews of a company would be good or bad. Intranet- this is internal use only so people can set up accounts and send information to each other. How information circulates within an organization There are many documents which may be used within organizations. This would include such things as notifications, stock order forms, receipts invoices and payslips. These are explained in a bit more detail below: Invoices are essential in any successful company. Invoices are needed so that the company knows what it is ordering from other companies and retail services. ...read more. But many people would use the internet to buy things because it is easy to access and u can do it within the comfort of your own home or workplace. You can get access to anything whist on the internet. For example many companies would use the Internet to buy things off retailers because it is easy to access and it is easy to understand. The intranet is internal. Things like email, memos, internal documents, internal policies, plans; information for personnel is used within a company. The company would use this regular to communicate with its workers so that people know what is going on within the company. Only people inside the company can use the intranet. The intranet and internet has a major influence is run and can help bring in income and make the business well ?? ?? ?? ?? 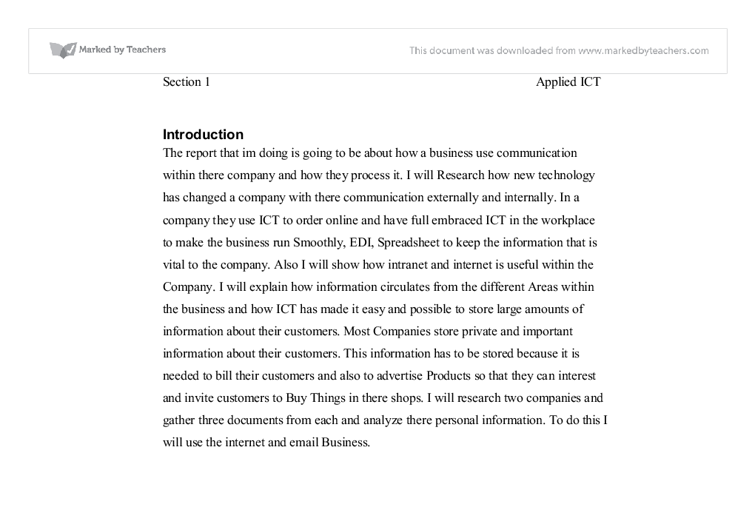 Section 1 Applied ICT 1 Section 3 Applied ICT Section 3 Applied ICT Section 4 Applied ICT Section 5 Applied ICT Section 7 Applied ICT ...read more. The target market for EVDOP Live is primarily teenage music fans and music producers. It?s no secret that they use various forms of social media to convey messages. With EVDOP Live using twitter the level of attention received by the target market is increased and they will become aware of the events which EVDOP Live advertises. o There is a distinct lack of communication between staff, within the Perfect Pie Company. o Customers are being extremely dissatisfied with customer service, and the Perfect Pie Company is not achieving standards of 100% customer satisfaction. o Customers have three ways of placing orders, (phone, fax, or walk in to the shop). 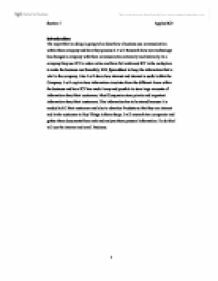 If a computer uses wireless technologies they may prefer to use WIFI for a network as opposed to Bluetooth. This is because a Bluetooth network can only support up to 8 simultaneous connections and WIFI can support up to 32.
so it is important that we cater for everyone on all platform's. We will test our website by uploading our website onto one of these platform's and then test if all our functions work on the site and that our website doesn't look different on the platform, after completing this process. A collision occurs, and both devices stop transmission, wait for a random amount of time, and then retransmit. This is the technique used to access the 802.3 Ethernet network channel. This method handles collisions as they occur, but if the bus is constantly busy, collisions can occur so often that performance drops drastically. can be perceived as ineffective, fiddly and look horrible, causing people not to wear them, and elderly people forgetting to turn the on or turn them up. This problem is also compounded by the lack of technical information expressed in the sort of language that makes it accessible to non-specialists. This XML document is just information wrapped in tags; it needs software to display it or for Tom to receive it. It doesn't matter if it is Header 1 or H1 or anything as long as the tag is predefined.